You are currently browsing the tag archive for the ‘Fused gold to iron’ tag. New works, Holiday events and more. Sit back, explore and enjoy. 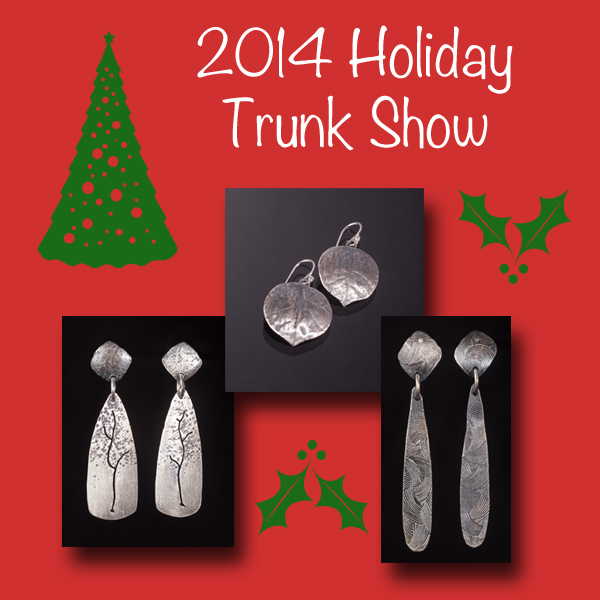 My annual Holiday Trunk Show will take place on Saturday, November 29, 2014 at Santa Fe Trail Jewelry in Monument, CO in conjunction with Small Business Saturday. I love doing this show at Marylee’s cozy cottage gallery and shop. She has created such a warm atmosphere for artists to display their works. I will have all of my latest offerings. There will be warm cider to compliment the Small Business Saturday shopping experience there, along with some tasty treats too. Please join us, if you live in the area. It’s a great way to kick off your Holiday shopping and support local businesses. Thank you. I have had a number of requests for earrings with posts, so here are a few of them. I love Aspen leaves. 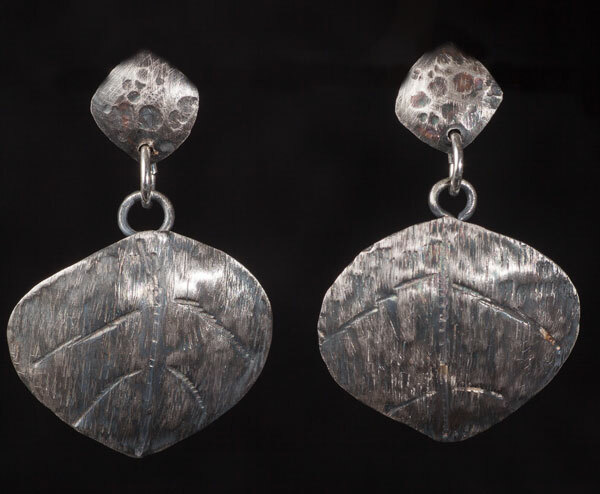 New to my Botanicals series, these have been created by the chasing and repousse technique. 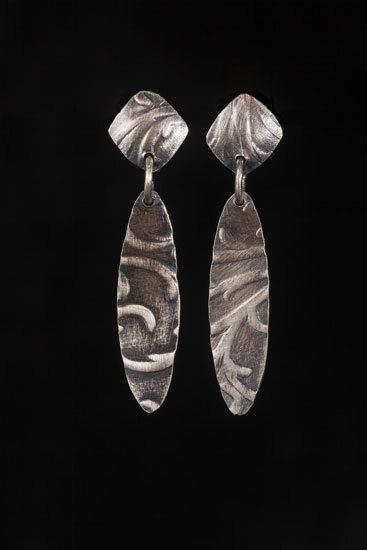 Sterling silver, oxidized to emphasize the details. 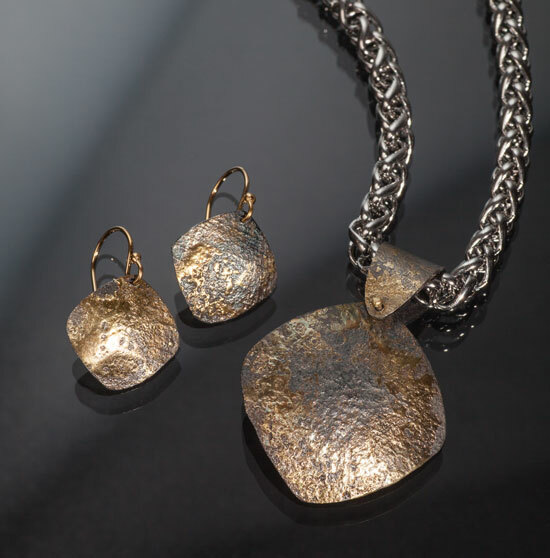 From Sensory Delights, the texture has been created through the use of a pattern sheet and my rolling mill. Oxidized sterling silver, to bring out the details. If you can’t make my Trunk Show, you are in luck. Once again, Nancy Bonig (founder of the Front Range Open Studios) will be hosting the Holiday Party for artists who were part of this year’s tour. I’m one of the participating artists who will be joining the festivities. 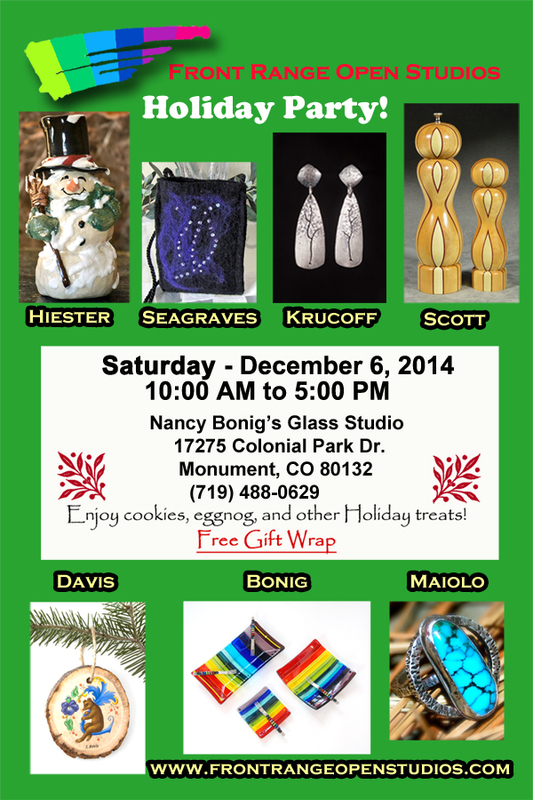 Mark you calendars for Saturday, December 6th from 10:00 AM to 5:00 PM. There will be plenty of goodies from food to drink to art! Free gift wrap with your purchase too. It’s a win win. Wishing all of you a very Happy Thanksgiving. I am so very grateful for all the blessings in my life. I appreciate your continued interest in my work and taking the time to read this blog. And, as always, I thank my husband Dan for taking such wonderful photographs of my work. I couldn’t do any of this without your love and support.